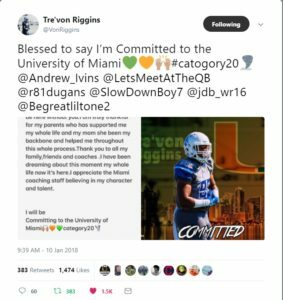 Tre’Von Riggins pledged to Miami on what would have been his grandmother’s 70th birthday. The new tattoo on Tre’Von Riggins‘ left forearm is extensive. The name “Chaney,” written in gold ink, spreads across the entire base of the arm and below it is a pair of dates. The first is Jan. 10, 1948 — the day Joan Chaney Riggins was born. The second — Feb. 4, 2012 — the date she died. Almost six years later, on what would have been his grandmother’s 70th birthday, Riggins decided to honor her by accepting a scholarship offer. The 4-star strongside defensive end from IMG Academy in Bradenton, Fla., committed to Miami last Wednesday. 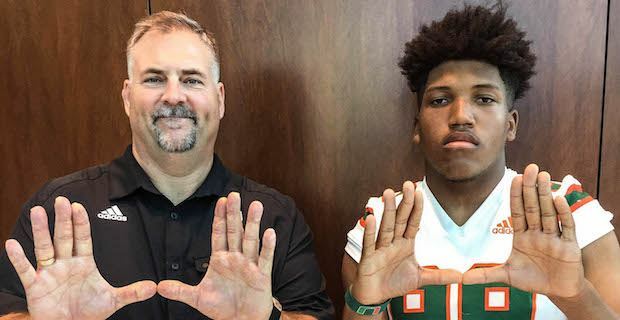 Riggins had been pondering a commitment for a little while, and the Hurricanes have made him a priority in their Class of 2020 since the summer. This, Riggins decided, was the right time to make his decision. The sophomore’s decision, however, didn’t come on a whim. 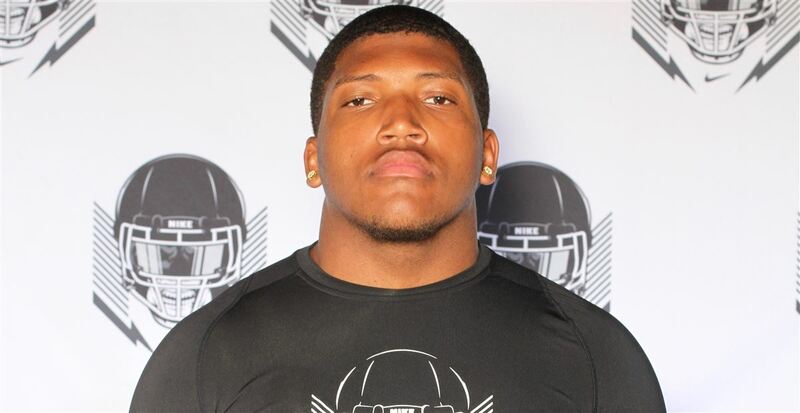 The 6-foot-4, 260-pound defensive lineman took his first trip to Coral Gables, Fla., in February for a junior day. Less than two months later, Miami extended a scholarship offer. Riggins returned to campus a week later. The Hurricanes beat every other major program to the punch with an offer and the early faith left an impression on the defensive end. South Florida offered about a month after the Hurricanes. Tennessee joined a few weeks later. So far, no one else has left a significant mark on the No. 65 overall prospect in 247Sports’ 2020 rankings. Riggins is already the third Ascender in the cycle to commit to Miami, a group which includes 4-star athlete Avantae Williams, the self-proclaimed leader of the nation’s top-ranked class. The Hurricanes have made a point to recruit IMG hard. The Ascenders finished the season No. 2 in the MaxPreps Xcellent 25, and Miami is taking advantage of the in-state program’s success. Brian Hightower, a 4-star wide receiver from IMG, joined the Hurricanes as an early enrollee this month. Miami is positioned well for a number of Class of 2019 prospects, including 4-star guard Evan Neal. The 2020 class, though, is where the pipeline may finally pay off. The Hurricanes sent coaches to Bradenton in November primarily to meet with Hightower, but also to check in with some of the underclassman targets. Ron Dugans became something of a staple among the Ascenders. Riggins’ relationship with the wide receivers coach became a major factor. While this past Wednesday was a date Riggins had pinpointed as a potential decision date for a little while, rumors around Dugans left Riggins uncertain as the day neared. Dugans, who played for Florida State, met with Willie Taggart earlier this month about joining the Seminoles staff as a wide receivers coach. The day before Riggins hoped to commit, he heard about Dugans’ future. The assistant coach was staying put. Riggins’ commitment plan came together without any worry. Will defensive lineman Tre’Von Riggins commit to Miami in near future? ORLANDO — Despite his place in the top 100 of 247Sports’ Class of 2020 rankings, Tre’Von Riggins is waiting on the offers to pour in. 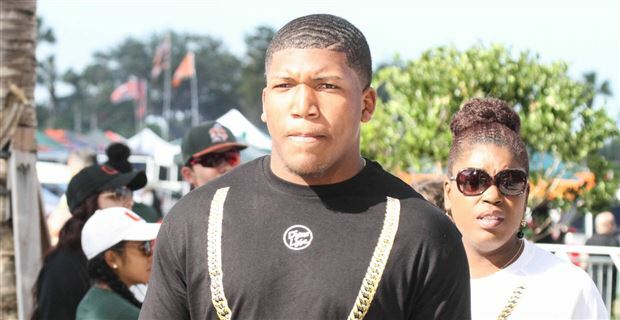 Miami got in early and right now it’s enough to make the Hurricanes the top choice for the 4-star strongside defensive end. In his own mind, Riggins doesn’t have a school which can claim to be running second. Being alone at the top doesn’t mean the Hurricanes are taking it easy while pitching Riggins. The 6-foot-4, 260-pound defensive lineman is one of Miami’s early priorities in the 2020 class in part because of his versatility. With two more years to grow, the sophomore could wind up as either a defensive end or a defensive tackle. Riggins’ primary source of communication right now is wide receivers coach Ron Dugans, but defensive line coach Craig Kuligowski has obviously weighed in, as well. Riggins made his only game visit of his sophomore season to Hard Rock Stadium, attending the Hurricanes’ home finale against Virginia. Riggins got a chance to talk with Dugans, Kuligowski and defensive coordinator Manny Diaz during his trip to Miami Gardens, Fla. His conversations with the coaches have been what’s impressed him most. 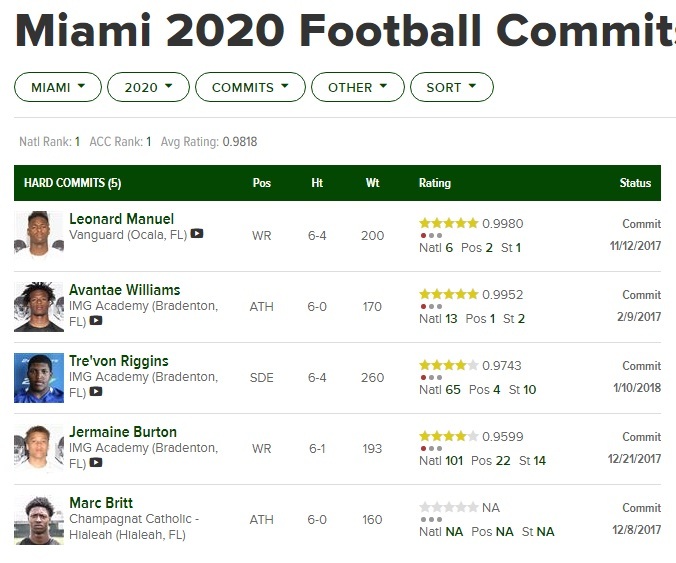 The biggest question around Riggins right now is whether he could be the next domino to fall in Miami’s already-loaded Class of 2020. The foundation of the group right now comes from IMG Academy in Bradenton, Fla., where Riggins just wrapped up his sophomore season. Two of Riggins’ teammates have committed to the Hurricanes since February, including 4-star athlete Avantae Williams, who said he considers himself the leader of the class. The 4-star athlete said to expect another commitment in two weeks. Could it be Riggins? The defensive end smiled when asked about whether a commitment was on the horizon, then he opted to play coy.